Note: The full text of the video is down below after the story. I drive a little white Toyota pickup truck. The smallest kind they make. The tires are all-season radials, but sometimes my work takes me to snowy places where I just plain don't feel very safe driving my little "Toy" truck with all-season radials. Plus, most of my in-laws live way up near Canada in Vermont's Northeast Kingdom. My brother-in-law has a lo-o-o-o-ng, winding, hilly driveway that I have to park at the bottom of whenever there's snow on it. My sister-in-law lives on a dirt road that is downright scary in the winter. In 2007, on the way to a gig at Mount Snow, I got stuck going up a hill, and it took me most of half an hour to get unstuck, get down the hill, and then try to get up again at full throttle, no brakes! I barely made it up the second time, and then proceeded to get stuck on another hill and had to do the same thing again. And there have been numerous winters when my little truck feels like it's just all over the road. You get the idea. Anyways, we had plans to go up and visit the in-laws in mid-December and then again a week later for Christmas. My lovely wife had planned for us to stay at her parents' house the first visit and at her sister's place the following week. Now, do you remember where I said that her sister lives on a dirt road that is downright scary in the winter? Picture this: It's a narrow, barely two cars wide, winding, hilly, dirt road that is usually a solid piece of ice from one end to the other all winter long; plus parts of it are domed: the only place to drive that you won't be skidding sideways off the roadway is right down the middle of the road... if there's a car coming the other way it's white knuckle driving! To make matters worse, there's numerous drop offs on either side, 45° angle hills, and no guard rails anywhere in sight. In one place, you come around a corner and there's a big hill with cow pastures on either side. "How picturesque!" you might say. But no, the cow pasture on the right starts out on the same level as the road, but as you go further up the hill the pasture drops off sharply! About halfway up the hill, it's more than a 10' drop off into the pasture at the very edge of the road with nothing to stop you from plunging over the edge if you skid even 3 feet to either side except two thin pieces of electric zap wire intended to keep the cows off the road! Whoa, man, is that scary! Plus, I've been stuck in their driveway several times; and actually had to leave my truck on the side of the road at the bottom of their driveway one winter visit not too long ago. So I told my lovely wife that I'd rather we stay at her parent's house every time (and sleep on that little tiny uncomfortable bed in their guest room) than to ever have to drive that road in the winter again. She was a little disappointed because she's a Cat Lady and had been looking forward to seeing and taking care of her sister's cat and having some alone time together. Well, years ago, maybe even decades, I had price-shopped tire chains and they were way more than I could afford. But when I called a place around here that carries them, they were well within my current budget, so for $108.36 I bought a pair of tire chains for my little truck. The sales guy said that I should practice putting them on in my driveway instead of getting stuck in a blizzard and having to get out of my vehicle during a blinding snow storm and put the chains on my tires for the first time somewhere on the side of the road out in the middle of nowhere. He also recommended that after that I should go somewhere and test them out by driving for just a quarter mile or so and then checking them for tightness. And then driving with them on for several miles. And, oh yes, don't ever drive on the bare pavement with them on, and don't ever go faster than 30 MPH. My lovely wife and I agreed to stay at her sister's place the following week if the chains worked well enough up there the first week. So we packed up and drove the 3 hours north (brrrr!) to her parents' house in E Burke VT smack dab in the middle of the Northeast Kingdom. The following morning, I went outside and practiced putting the chains on. Then I drove up and down their driveway, stomping on the brakes, swerving sharply, etc. like 9 or 10 times before climbing out and testing the chain for tightness. They were good and tight still. And I was very pleased with their performance on the driveway, so now I wanted to test them on the road. There was a little stretch of black pavement between the driveway and the dirt road, though. I had to put the right tires off onto the snow and drive about 4 miles an hour or the whole truck shook itself to pieces! 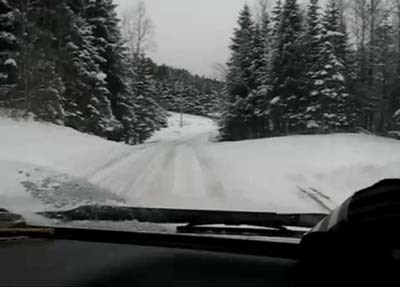 But when we made that turn off the blacktop onto the snow-covered, winding, hilly, narrow road, everything was wonderful! They worked like a charm! And Nancy took the little 48 second video above to commemorate the trip. NANCY: What are we doing today, Trevor? N [laughs deeply, then says laughingly]: Hey! Cut it out!!! T [grinning]: They work! [glancing right] Whoa, where's this road go??? N: Ooh! [camera pans to view out front windshield] No. [reading sign] Maple Lane. T: We're not going on that road. N: No. [reading other sign] Mountain Hunger Road. [heading down a hill] Wheeee! Down the hill! Ooooo, whee! T: You like that hill?, wait 'til we get on Belden Hill Rd! N: No. No Belden Hill Rd today. T: Oh, I'm in ecstasy. This is great! I should've gotten these long ago. 1. Throughout the whole video, we're moving along at as close to 30 MPH as I can. 2. At the beginning, notice that I'm wearing heavy-duty work gloves. They don't keep my hands warm for long outside, but they keep my hands dry and I can put the chains on and off while wearing them. 3. When I say "They're working. Look! ", you can see my arms turning the wheel back and forth! 4. And I absolutely love the next part: Nancy laughs a long throaty roller coaster laugh and says through more laughter, "Hey! Cut it out!!!" 5. When I say "Whoa, where's this road go?" and the camera pans to the view out the front windshield, there's two street signs. It took me a while to figure this out, but that's not actually a road that's covered with 3 feet of snow on the right. It's just the town line and the name of the road changes, so the first street sign is a double sign the town line indicator on the bottom and Maple Ln on the bottom, and the second says the new name of the road. 6. Nancy says, "Mountain Hunger Rd" because that second sign said "Mt Hunger Rd", but it's actually Mount Hunger Rd. 7. And she says, "No," meaning that there's no way we're going on that road. 8. And then I say something about going on Belden Hill Rd. The thing is, we had passed that road without my even noticing it well before this video began. Turns out, Belden Hill Rd is a road that's covered with 3 feet of snow! In fact, it's an extremely steep road with no houses on it and is closed in the winter. That's why we missed it. 9. Check out the monotone in my last line where I say, "Oh, I'm in ecstasy." It's just that I had to concentrate on driving so much that I had no energy available for emotional content... but I really was feeling pretty awesome about my new tire chains, people! The following week, I put the chains on and took them off each time we drove in or out of my sister-in-law's road. I got pretty good at it, too: installation and removal each ended up only taking about two minutes from beginning to end. And they work like a charm, too, so there's no more fear of winter driving. I can now fearlessly go just about anywhere in the winter... even to my sister-in-law's place! As I said in the closing line of the video: "This is great! I should've gotten these long ago."